We look forward to seeing you at this event in 2018. Starting in the Victorian Capital at the Melbourne Zoo, this ride makes its way from Melborne Zoo onto Brunswick Rd, makes it way to Plenty Rd and onto Wittlesea where we stop for coffee. 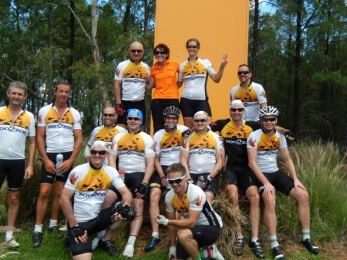 Riders make their way onto Yea for lunch and then a mandatory stop at "Yarck" before arriving in "Bonnie Doon". After enjoying the serenity of "Bonnie Doon" it is time to set off to Mansfield, Whitfield, Moyhu and Myrtleford. Animals on Bikes is a 120 kilometre paddock art sculpture trail displaying 111 two metre high structures (and some smaller letterboxes) on the back road from Molong to Cumnock to Yeoval to Dubbo Zoo. The sculptures have been created by local farmers, farmers wives, men's sheds, sculptors, preschool kids, playgroup mums - anyone with an artistic flair! This unique creative project captures any travellers imagination, promotes local tourist operators, showcases rural creativity and encapsulates the spirit of regional NSW. vehicle is kitted out with an esky and snack boxes full of those great goodies we all crave on long rides. Entrants must wear an official Zoo2Zoo riding shirt to participate in the Zoo2Zoo. If you have done a previous Zoo2Zoo, you are able to wear the riding shirt from that ride. Otherwise, you are able to purchase a jersey for $80. The cycling kit will be available for collection on the morning of the ride at the start of the Zoo2Zoo.